Imagine a stylish home that's far away from any urban centre. Swiss architects Meier created a home in the countryside that is the epitome of contemporary living. They set out to create a design that would address the needs for domestic life with a modern twist with careful consideration for how the different spaces of the house would interact. There is an authentic feel to the playful duality of outdoors and indoors because the house is set near a forest and is full of lush plants. We will take a look at some inspiring features of this unique house. Let’s go! A look at the home shows that it opens up into the garden, where the yard hosts an expansive outdoor living and dining space. 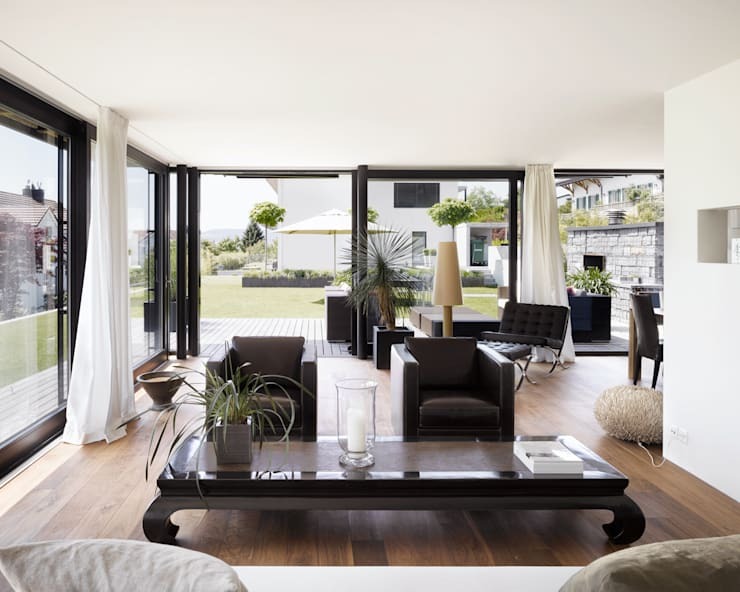 The floor to ceiling windows on both floors create a connection between the indoors and the outdoors. Upstairs has a wide balcony space that’s full of potential. The house echoes back the verdant green of the nearby forest with its many plants and green accents. Beautiful shades of slate and charcoal grey accompany a modern black and white palette. Let’s take a look inside at the open plan living space on the main floor. This living space features a cozy entertainment area. The low tables and couches give this room an informal feel, creating a space where you could completely relax and watch some TV. Wrap around windows give dramatic flair and green accents inject some life into an otherwise drab colour palette. 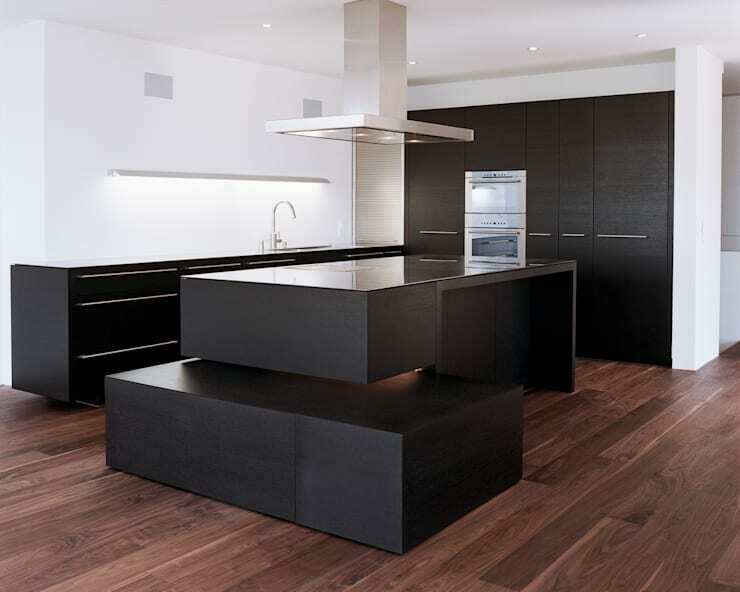 The dark floors here echo the stylish modernism of the kitchen. We love the understated fireplace along the far wall! This room is so airy that we can almost feel the breeze. The massive glass sliding windows can be easily tucked way to bring the outdoors into this modern living space. The warm natural wood floors and white curtains bring a freshness to the room. All black furniture usually has a harsh look in a room. This is offset by the plentiful natural light coming into the room. Also the plants that dot the living room soften the overall look. The result is a trendy and stylish living room with a great view. Catching sight of the kitchen we can see that the space is thoughtfully laid out. 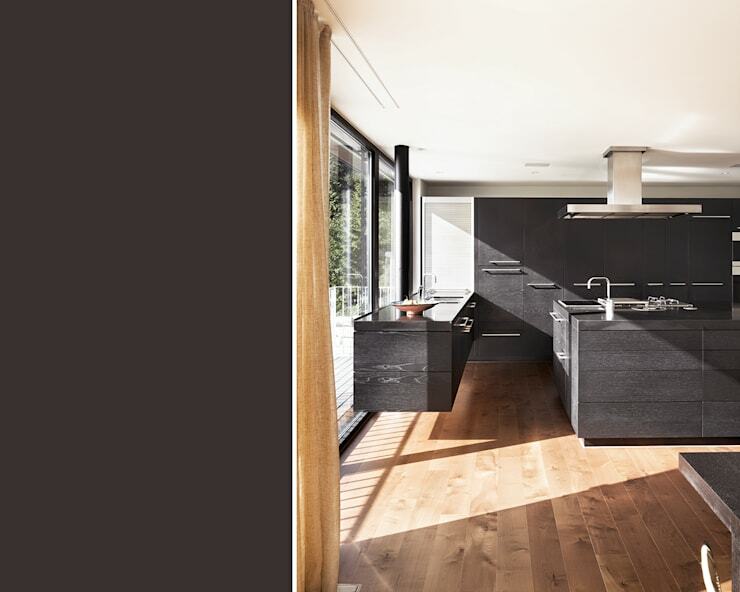 The dark grey cabinetry and joinery dominates the look of the kitchen. The streamlined stainless steel fixtures give the kitchen some professional appeal. The counters and the sink that look outside must be a fun place to prepare a meal! This kitchen has an amazing floating island fixture. Taking a closer look at the central island we can see that it is a one of a kind piece that makes this kitchen stand out. The cleverly designed island incorporates some built in seating. The island’s negative details give a minimalist feel to the kitchen and the reflective quality of the counter is ultramodern. This is a bold piece to have in your home! For more modern designs, check out our ideas for black and white kitchens. This bathroom is the hidden gem of the house. It opens into an enclosed garden. Here we can have the benefits of bathing in the outdoors without any of the fuss about propriety! In this room, the modern elements blend well with the natural. We love the floating bathroom counter with the deep sink. The large unframed mirror helps make the room appear bigger and brighter. Without a doubt, this is a beautiful bathroom where you could unwind with a bath after a long day, or, simply get ready in style. It may be a country house but this home is high on style! The glazing and the surreal kitchen make this a gorgeous living space. They brought the feeling of the outdoors inside to make a comfortable home. We could feel at home here pretty easily. Thanks for taking a look with us and if you liked this house you’ll love this family home that doubles as a work of art. How do you have a twist of nature in your modern home?